Here at Home Stratosphere, we are enamored with the burgeoning world of smart home technology. These interconnected devices promise to revolutionize the way we live in our homes, making things simpler, more efficient, and far more reactive to our presence. We have covered a broad spectrum of smart home technology, from individual devices for utilities, entertainment, and communications, to comprehensive networks designed to tie it all together. Most importantly, we have focused on what makes this technology so essential as we march into the future. With all great new technology, there comes a question of whether to adopt it or not. Because of the cost, not all innovation is a truly useful improvement. With our guides to the best smart home devices around, we aimed to focus only on products that can measurably improve life at home. Sometimes this improvement comes in terms of convenience. Imagine leaving work and heading home to an empty house, finding it properly warmed, lit, and unlocked. It’s not unwanted guests; it’s the smart home equipment preparing for your arrival! The best smart home products seem to anticipate your needs, reacting to your lifestyle to produce preferred settings and features before you have to ask for them. This can come in the form of thermostats, entertainment devices, security systems, and more. Another form of improvement is efficiency. When your devices are connected to each other and to the internet, they have more information to work with. Your furnace can operate only at times it knows you’re home, or your window shades can remain shut while everyone’s out. These devices result in long term bill savings. The best examples of smart home technology provide convenience and efficiency at unheard-of levels. Imagine controlling every aspect of your home’s functionality from a single app on your smartphone, and you’ve got the right picture. Read on to check out our extensive guides to specific sets of smart home technology, including utilities, security, lighting, entertainment, and beyond. Each category page will grant you a wealth of information to get you started on a smart home of your own. You might not realize it, but smart technology has integrated nearly every aspect of home life, including lighting. When you can control the lights in your home from anywhere in the world, program them on a schedule, and have them light up automatically as you arrive, why would you ever go back? We examined some of the best smart home lighting solutions out there and curated a list of the most innovative, efficient, and useful products for our readers. You’ll want to read the list yourself to get familiar with the way your home will be lit in the future. One example is the Holî SleepCompanion. 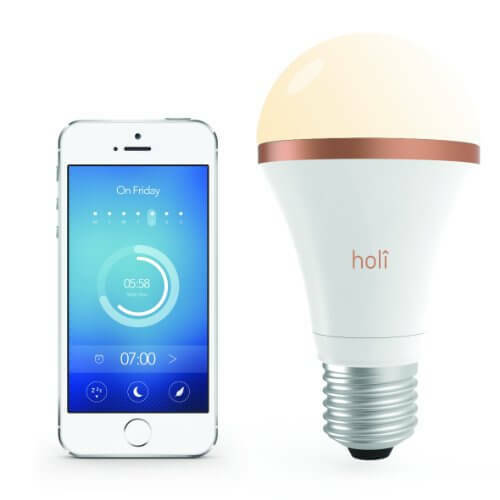 This specialized smart bulb is designed to wake you up naturally with a specifically tuned blue tint that reduces the level of melatonin in your body. It’s got another mode to help you fall asleep faster. Basically, this product will not only light your room, but help you feel better rested in the long run. 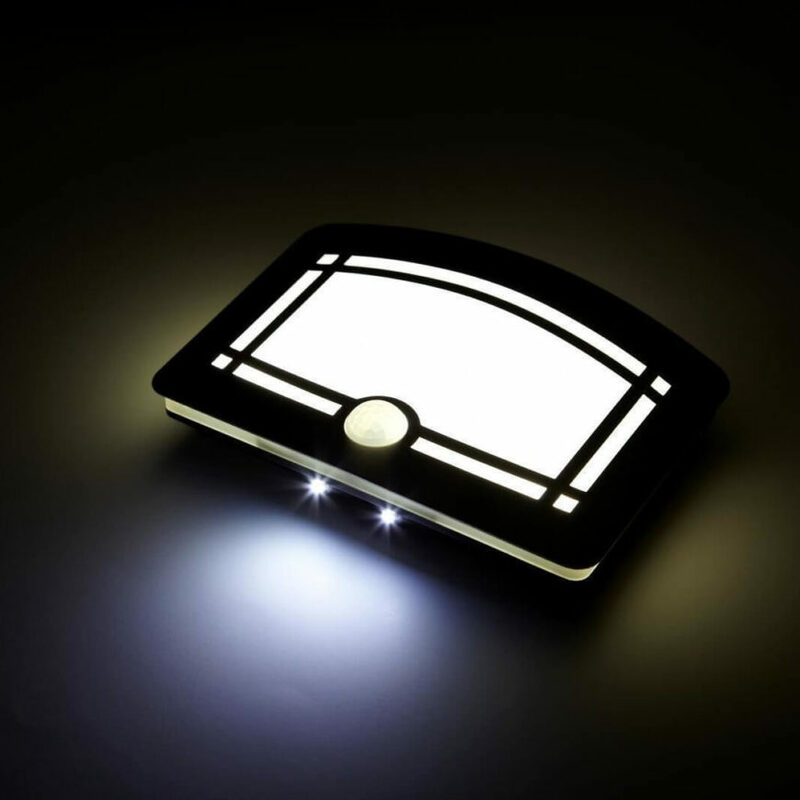 Another innovative lighting product is the Flux Bluetooth Smart LED. 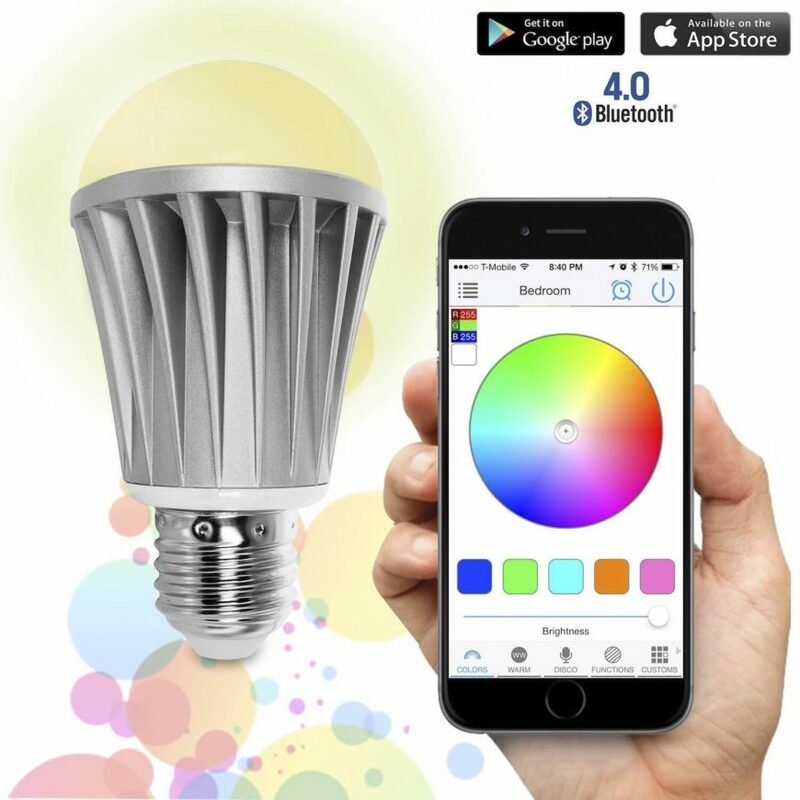 This single bulb supports over 16 million color gradients, and is controllable entirely via a smartphone app. It can be programmed to shine different colors at different times of the day, and can even be programmed to react to music in the room. 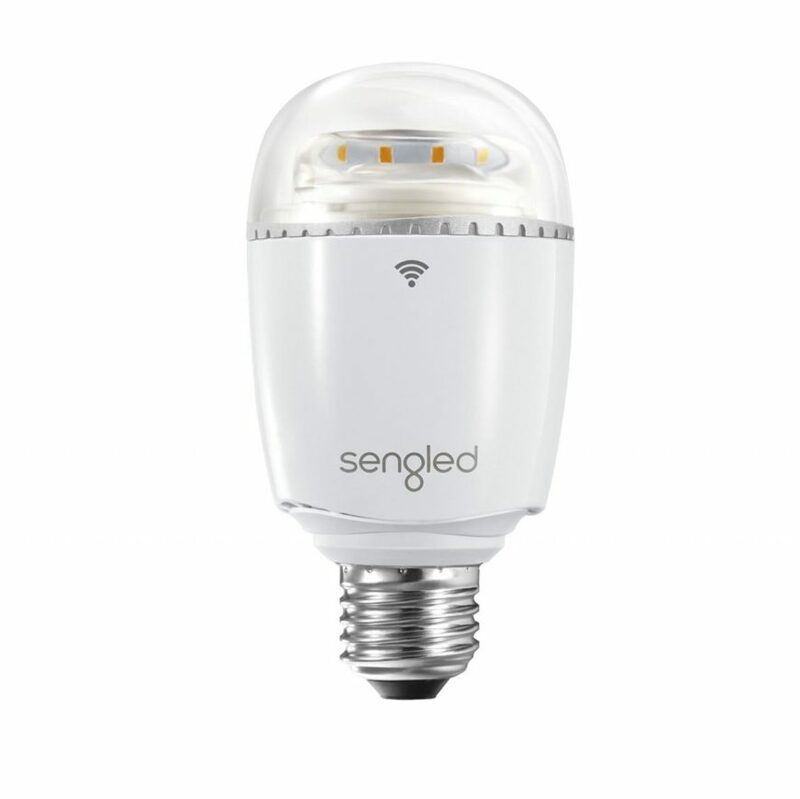 Here’s the Sengled Boost. Have you ever noticed that your wifi doesn’t quite reach every corner of the home? While signal boosters have been around for a few years, now you can safely hide them away in full integration with your lighting scheme. 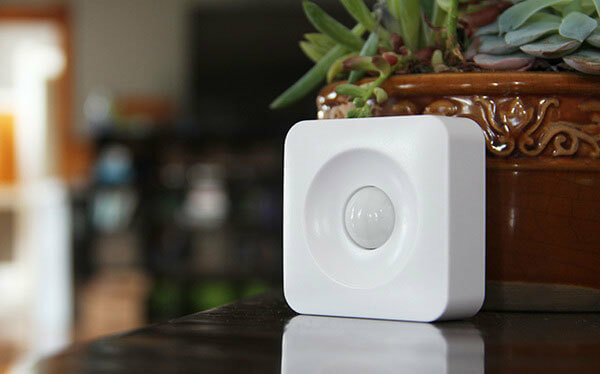 The Boost features a built-in signal extender, amplifying the range of your wi-fi while providing long-lasting light. The more of these you install, the better your wifi will be around the home. Check out our complete Smart Home Lighting guide! With wireless technology, smartphones, and Internet of Things becoming part of everyday life, our very homes are turning into computer controllable spaces. This includes, of course, your entertainment devices. We wanted to sort through what’s available in terms of smart home entertainment devices, curating a list of some of the best, most easy to use options out there. When it comes to smart automation in the home, your entertainment devices are perhaps the first obvious step to take. Your existing electronics are likely ready for connectivity if they were purchased recently. Whether you’re looking for a central hub to control them all, a smart way to connect to your phone or tablet, or home automation, this list is your place to be. Here’s the Logitech Harmony Home Hub. Using a free companion app, this sleek device is a smart hub that allows you to take smartphone-based control of up to 8 home entertainment and other automation devices. It’s the physical centerpiece of any smart entertainment setup, the key component to tying the whole thing together. In addition to controlling what’s on the screen or playing from the speakers, it can interface with smart lights, thermostats, and other home essentials to give you control of your entire house. The Amazon Echo is a smart home hub that’s designed around your voice. Once it’s plugged in, you operate it entirely hands-free. 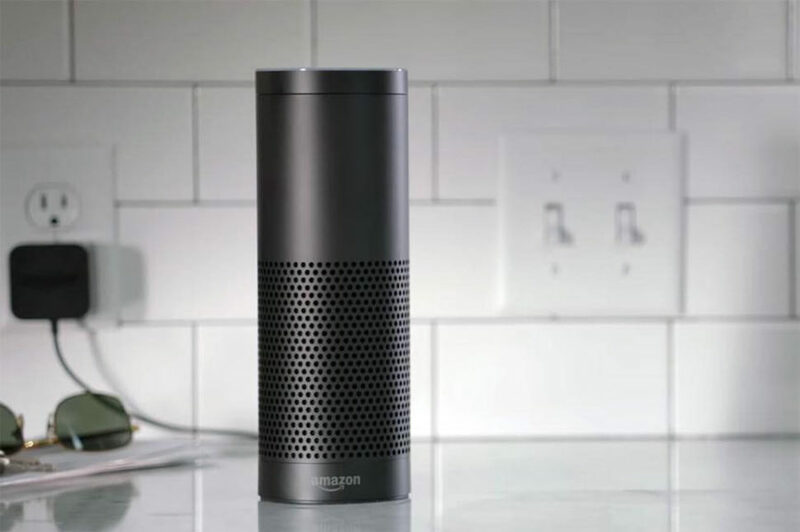 Not only can it play your music via built-in apps or Bluetooth streaming; the Echo can control other smart devices around the home, from lighting and switches to heaters or anything else you can plug in. Take a look at the NEEO Thinking Remote. With a built-in database of over 30,000 devices that it can connect to and control, the NEEO is designed for simplified, centralized control of your entire smart home. 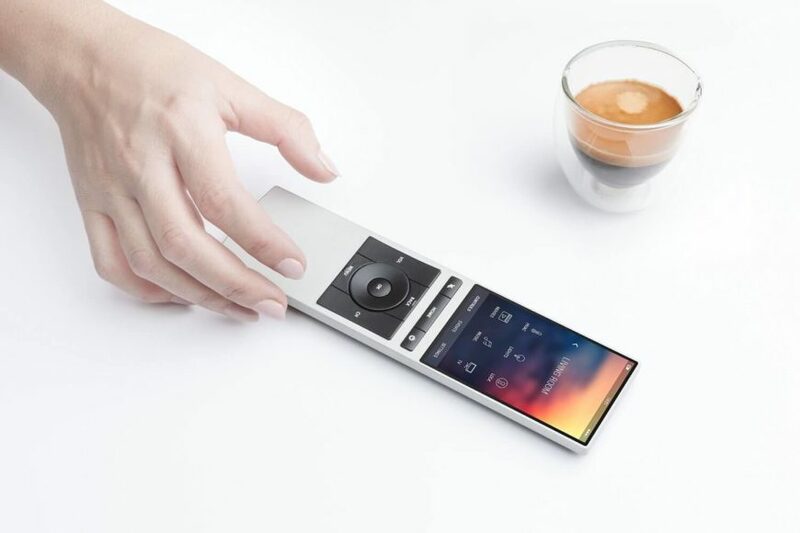 Beyond this, the remote offers hand recognition and a high resolution touch screen, to make personalized, automated control as direct and easy as possible. It’s even got a “find a remote” SOS feature! Check out our complete Smart Home Entertainment Devices Guide! With smart home technology, your appliances can become more convenient, safe, and efficient. Let’s face it: we take our appliances for granted. If they’re doing their job, we don’t think about them. When they break, they get replaced. What if they could do more for us, and we could do more with them? That’s what smart technology is all about. Beyond connectivity, it’s designed to improve the way we interact with our homes. This gallery is designed to be a compact but comprehensive overview of how smart home technology can truly improve your essential appliances. While not all new technology is an improvement, the examples here most certainly are. Whether it’s adding new safety features, improving convenience, or simply making it easier to interact with and operate your appliances, there’s an aspect of smart technology that you’ll find most appealing for your own home. This is the LG Smart ThinQ Electric Single Oven Range with Infrared Grill. 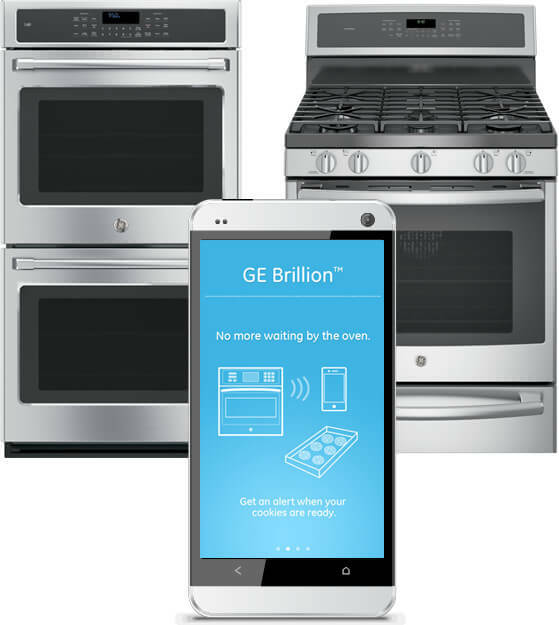 Working with a specialized companion app for your smartphone, this oven can be programmed and controlled from anywhere in the world. If you’re at work and want to preheat, you can cut down on cooking times. Changing temperature, mode, and any other settings can be done with the extensive control panel or your smartphone. Here are the Café Series Ovens from GE. 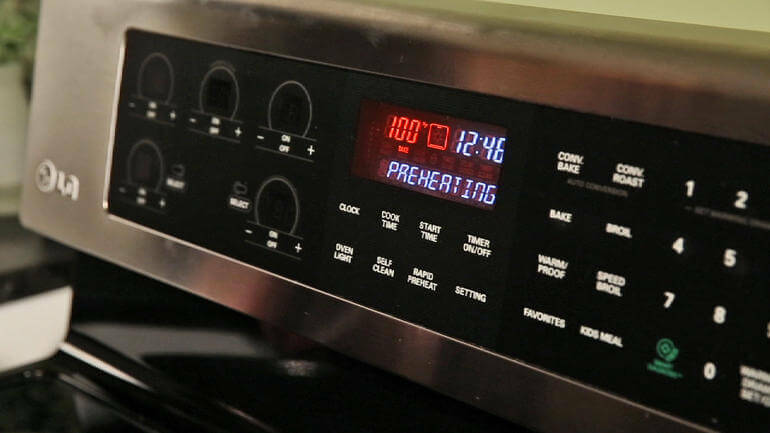 The worst part of cooking with an oven is waiting for the pre-heat; this connected app erases that problem forever, letting you turn the oven on, pre-heat, set timers, and change the temperature from anywhere. Even more, you can set timer and temperature alerts so that your phone lets you know the second it’s ready. Here’s the Wemo Enagbled Crock-Pot Smart Slow Cooker. 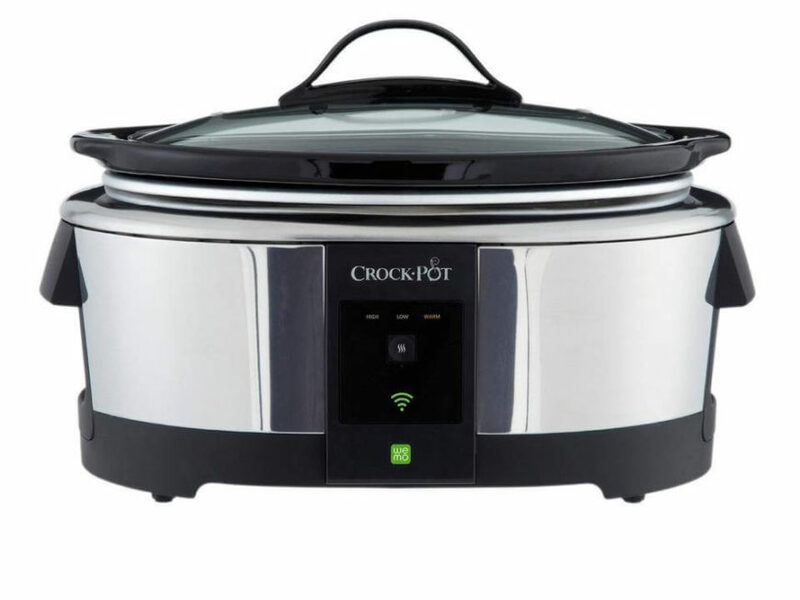 We admit that a crock pot wasn’t the first place that we’d think of as a great use for smart technology, but this device changed our minds quickly. With a companion app, you can control temperature, timers, and scheduling with your smartphone from anywhere, allowing you to start cooking, warm food that’s already done, and schedule dinner to be ready the second you’re home. It even brings peace of mind to those who worry about leaving dinner slow cooking while they’re at work. Check out our complete Smart Home Appliance guide! With smart home technology, your utilities can become more convenient, efficient, and safe. There’s really nothing more you can ask from an upgrade, so we’re delving in to the myriad options, features, and improvements that smart technology can bring to the home utilities we use every day. The first requirement for a worthy upgrade is, of course, whether it improves the product and your experience with it. We think that the below examples of smart home utilities all pass that bar and then some. 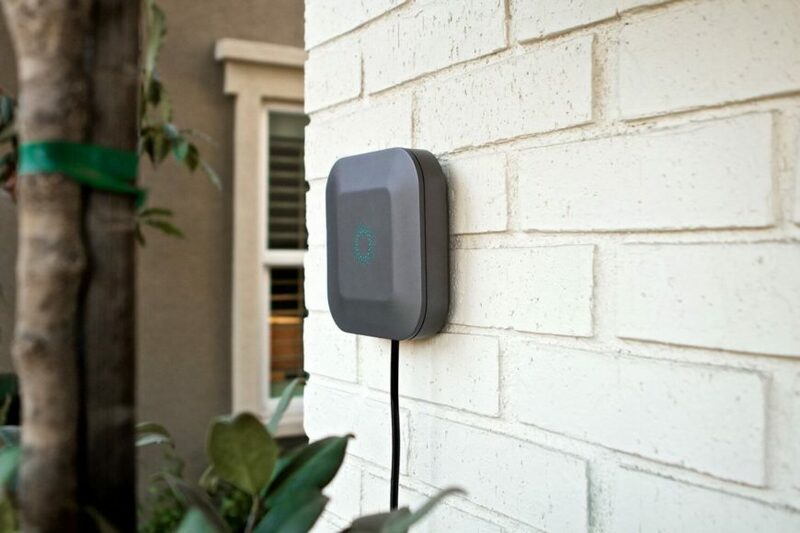 The Blossom Smart Watering Controller is all about controlling your sprinklers from anywhere, using smart technology to water your landscape as efficiently as possible. With an accompanying smartphone app, you’ll be able to monitor and control water usage from anywhere in the world, setting different waterings for different yard zones. 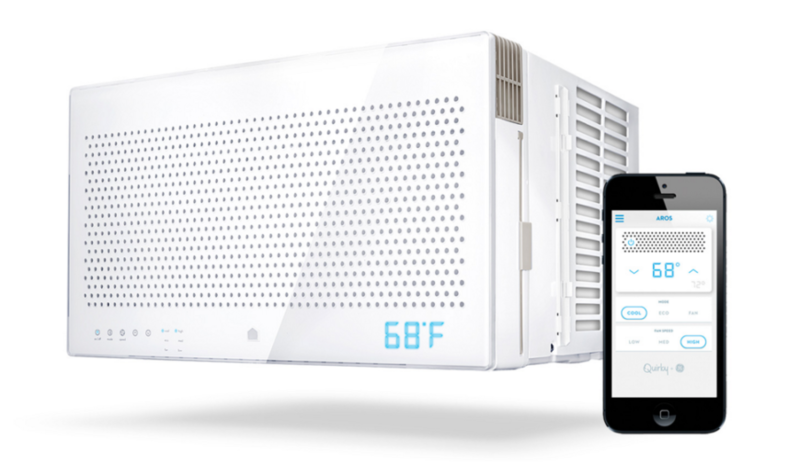 This is the Aros Smart Air Conditioner. Regular window AC units only give you two choices: Leave the air on all day, wasting electricity and money, or come home to a hot and humid home. Instead, Aros uses information gathering to learn about your patterns and habits, tailoring its operation to your home and lifestyle. Used in combination with the Wink smartphone app, Aros can automatically maintain the right temperature at the right time, maximizing savings in the process. Additionally, it can be controlled and monitored from anywhere in the world. 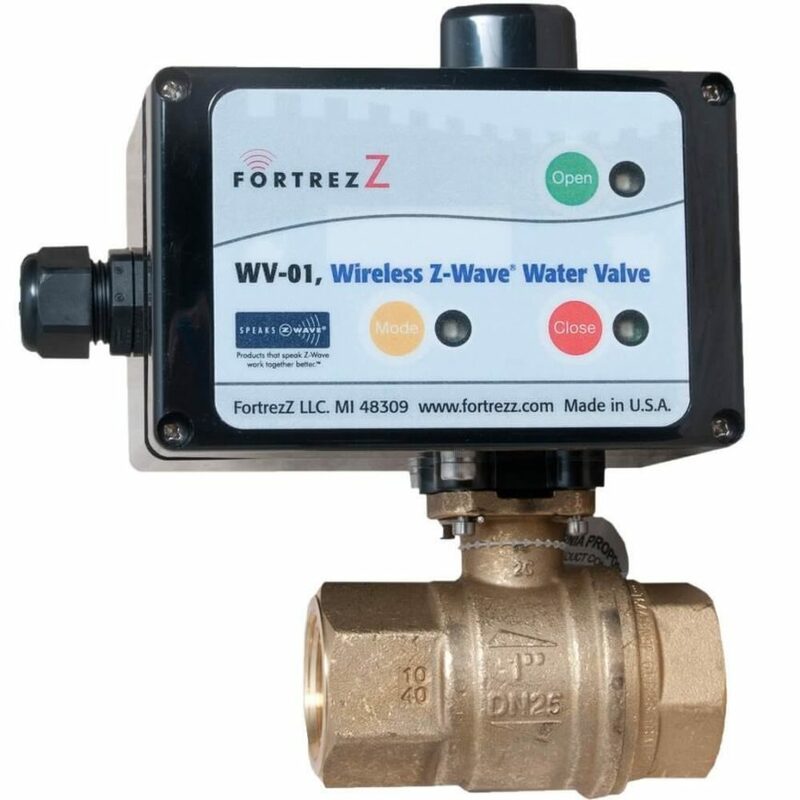 Here’s the FortrezZ Wireless Z-Wave Water Valve. With this valve plumbed on your home’s water main, you’ll be able to control the water supply remotely through the Z-wave Home Automation system. This opens up a host of opportunities. When leaving home for vacation, you can have peace of mind knowing that nothing will go wrong with appliances. If an appliance leaks, for example, flood sensors can detect it, shutting off the water supply automatically to limit damage. In the meantime, you’ll be notified by phone so that you can get right on the problem. It’s a perfect solution for vacation homes, rental units, and even commercial buildings, and can be applied on dishwashers, water heaters, bathtubs, refrigerators, and more. Check out our complete Smart Home Utility guide! This might come as a surprise, but even the windows and shades of your home can be improved with smart technology. These products allow for the complete customization and control of the natural light entering your home. What are some of the major benefits of smart blinds? Let’s count them! First of all, energy savings is a huge positive benefit. When your blinds can be smartly programmed or automatically set to open and close at the appropriate time of day, your home can enjoy the passive energy savings. When the blinds are closed while you’re away at work, the home will stay dark and cool in summertime, so that you can arrive home to a comfortable space without the expense of air conditioning. Even better, most of these can be programmed to open before you arrive. Even better, you can make sure that the blinds are closed for bedtime, but opened before you awake. This gives a great start to the day, with natural light helping raise you out of slumber. Here’s a look at Hunter Douglas Shades. The beauty of these modern shades is that, along with sporting a double layer that perfectly diffuses sunlight, they are utterly easy to operate. Along with physically manipulating them, the shades are designed to work with either a remote control or your smartphone or tablet, with their signature Platinum app. You can set schedules and “scenes” to rotate through, changing the way your shades look throughout the day. InvisiShade: “Pushbutton privacy” is what the company calls this smart glass technology, which changes from clear to shade in 400 milliseconds and back to clear on command. It was initially designed for security at high-level government installations, but is now available to everyday folks like us. The InvisiShade can be controlled with standard wall switches, remote controls, and even tablets or smartphones. Even more impressive, it can be turned into a touchscreen computer or cinema screen. With seamlessly classy blind design, the Wink Bali motorized window treatments boast an unassuming look that blends in with virtually any style of home. The blinds are controlled via the Wink app, giving you total command of the light situation at any time of day, from anywhere. The blinds themselves can be powered by your choice of battery, wall plug, or even solar power. When you think about smart technology that improves life at home, cameras might not be your first idea. We’re here to open your mind to the convenience and safety possibilities inherent with smart home camera solutions. So let’s get the big idea out right away: smart home technology has been shown to improve almost every functional aspect of your house. However, when it comes to security, smart technology is bringing it to many homes where it had never been considered before. 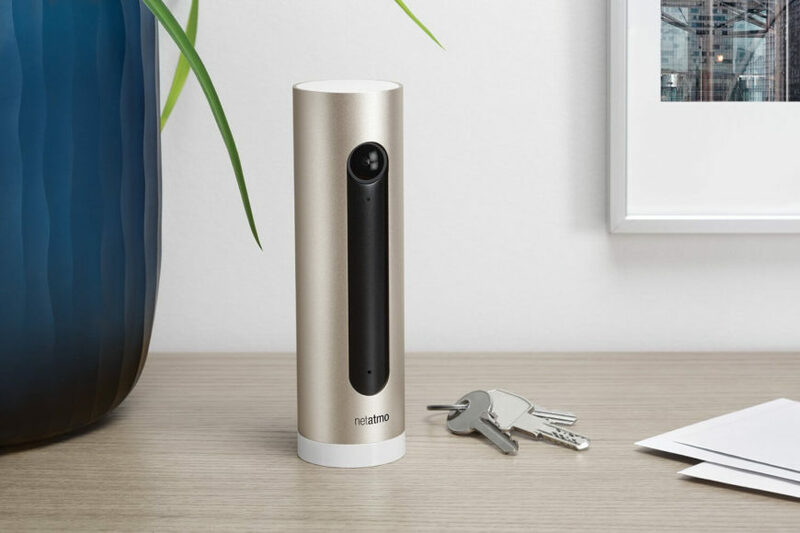 The Netatmo Welcome utilizes facial recognition technology, providing a powerful remote security monitor and more. It can alert you when your children or other family members walk by, sending their names directly to your smartphone. You’ll have peace of mind knowing that your loved ones are home safe. It will also, of course, alert you when it sees a stranger. This device can be used to keep an eye on the home while you’re away on vacation, or to even check up on the babysitter using your smartphone or tablet. Even better, there’s no subscription or contract fees to maintain it. Meet the Kuna Integrated Smart Home Security Lantern. This unusually stealthy product is a smart wifi-enabled security camera and video intercom, built into a simple and elegant outdoor light. 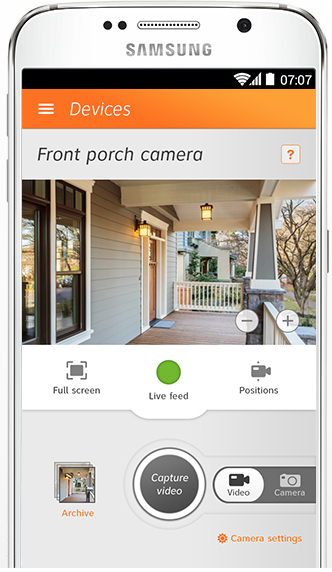 An HD video camera and motion detectors will alert you to any movement outside of your home with push notifications on your smartphone. Even better, you can communicate with anyone at your door via two-way intercom. This is all about peace of mind, and preventing break-ins so that you don’t even need to identify a thief. 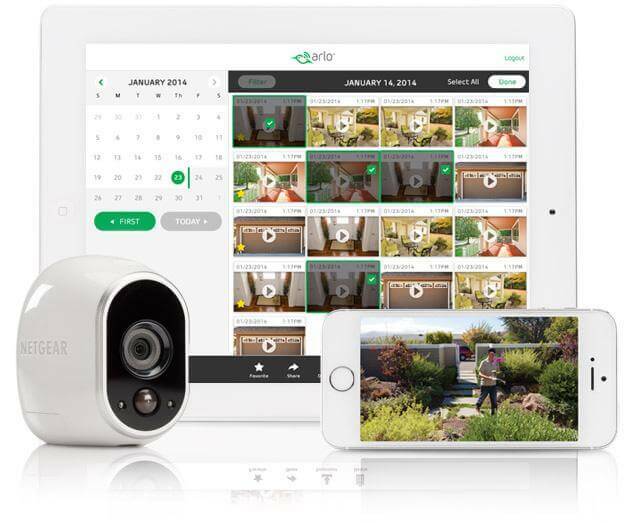 This is the Arlo Smart Home Camera System. It is an indoor/outdoor wireless camera system designed to seamlessly integrate a security system into your home environment. The weatherproof and uniquely styled camera uses motion detection, night vision, and an accompanying app to give you total visual command of your home. It will capture and save video clips and alert you via smartphone or computer whether you’re home or away. 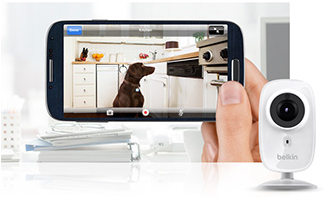 Check out our complete Smart Home Cameras guide! When your security catches up with the technology in your home, everyone wins. Well, everyone but thieves win. We’ve enjoyed covering the myriad new examples of smart home technology that grant convenience, safety, connectivity, and peace of mind to homeowners, but none have felt as essential and life-changing as these new smart locks. First of all, the biggest and most obvious improvement smart technology brings to door locks is the ability to go keyless. While we’ve had keypads for years, this is different. Many of these models allow you to program specific “users” that can be recognized by key code, smartphone app, or even biometric fingerprint scan. This means that your locks can now be programmed to allow specific people in the home and keep out everyone else. Even better, many of these devices allow for complex programming. Now you can allow, for example, a housekeeper in the mornings, and a babysitter at night, with access denied at any other times. 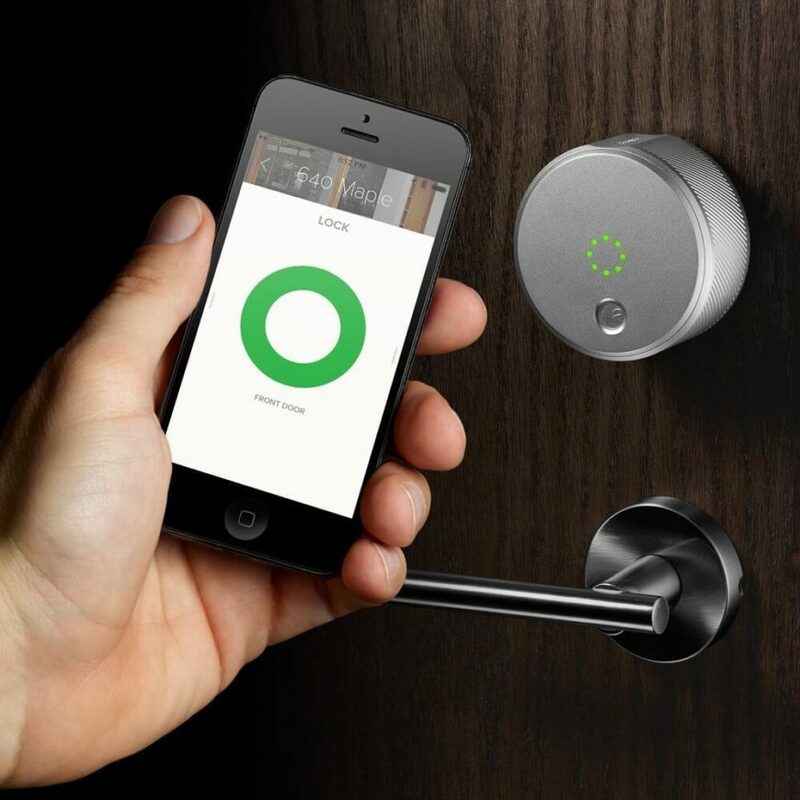 The August Smart Lock allows you to lock and unlock your doors, create virtual keys for guests and family, and keep track of everyone who comes and goes right from your smartphone screen. It’s got an auto lock and unlock function, making it easier to carry those groceries inside without having to stop. The ability to log and track who comes and goes is a valuable security option that we think shows some serious promise. 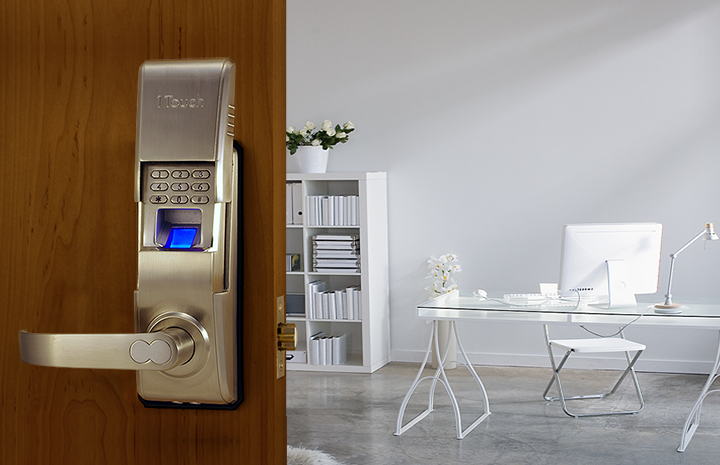 Meet the Yale Security Real Living Electronic Touch Screen Deadbolt. This touchscreen home door deadbolt lock is fully motorized and communicates with the rest of your smart home via Z-Wave Technology. The satin nickel finish gives it a timeless appeal like any old standard lock you’d buy purely for safety and aesthetic reasons. When integrated with a Z-Wave smart home system, you can lock or unlock doors with your smartphone, as well as program loads of options, like setting the lights to come on as soon as the door is unlocked. Here’s the 1Touch Evo3 Keyless Fingerprint Door Lock. This handsome brushed nickel smart door lock features a sliding cover to discreetly obscure the keypad and fingerprint scanner. Featuring a 36 user fingerprint capacity and up to 78 individual password users, it can track and control the access allowed to everyone you want in your home. With its multi-tiered security layers, you can convert your home into a smart gateway in minutes. The fingerprint scanner can be the perfect match for families with children, as the kids don’t need to be trusted with holding on to a precious key all day. 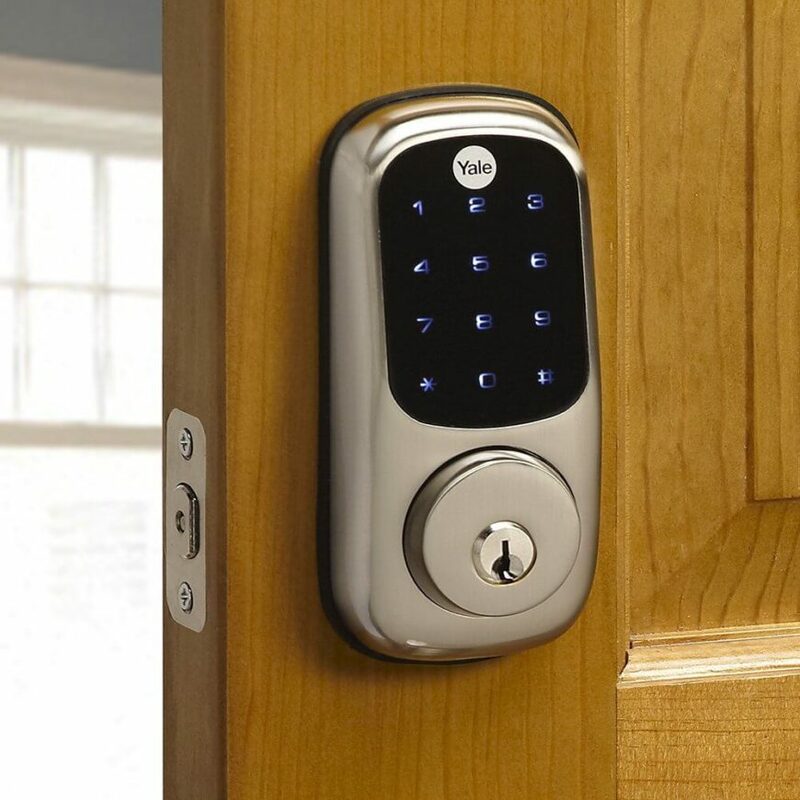 Check out our complete Smart Home Door Locks guide! When it comes to garages, smart tech brings unexpected improvements that feel instantly and definitely welcome. First of all, what does smart technology bring to the age-old game of garage door openers? The answer is a surprisingly long list. With normal garage door openers, we were finally released from the tyranny of manual garage doors. No more getting out of the car and hauling up a heavy, loud door just to put the car away and then do it over again in reverse. Smart technology brings a similar revelation in convenience and safety. 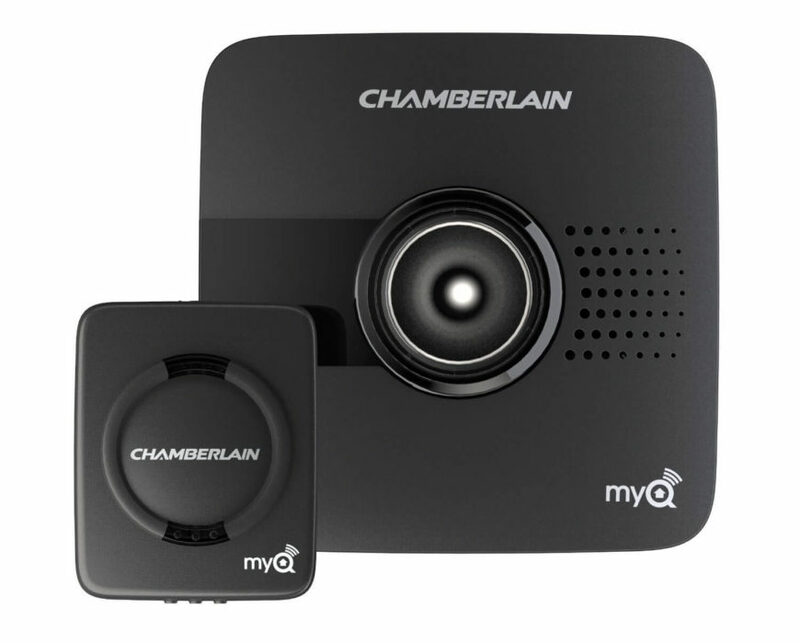 This is the Chamberlain MyQ-Garage. Here’s another innovative way to control your garage door opener with your smartphone. Along with the device itself, you get a free app that allows you to control and monitor your garage door remotely, via any smartphone or tablet. You’ll receive alerts if and when the door opens or closes, giving you a heads up on any situation at home. It works with almost every major brand garage door opener made after 1993. The Gogogate2 is a wireless remote garage door opener that operates with a sensor to open, close, and monitor your garage door from anywhere in the world. Using wifi connectivity and an accompanying free app, you’ll be able to take complete command of your garage situation from anywhere you’ve got an internet connection. 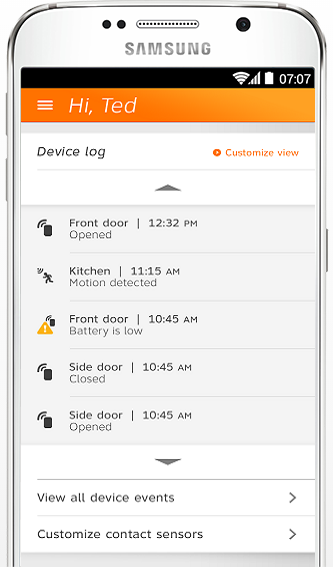 Swiping with your smartphone can now open and close the garage door, even while away from home. The Quirky Ascend is a perfectly sleek new device intended to convert your existing garage door opener into a smart home product. 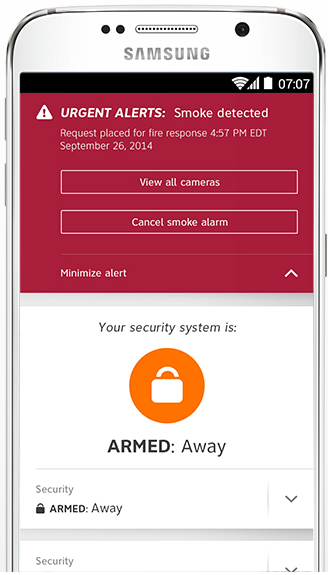 It connects with the Wink smartphone or tablet app to let you monitor the door’s status from anywhere on Earth, receive real-time alerts when it’s being used, and remotely grant access to friends and family when needed. Check out our complete Smart Garage Door Openers and Gadgets guide! If you’ve been keeping up with our smart home coverage, you’ll know that sensors are one of the key components that bring it all to life. These sensors are what bridges the gap between the electronic environment and the tangible space of your home. We love smart home devices because they allow our basic day to day lives to catch up with the technology that’s been improving the world on a large scale. In this more intimate setting, technology can be used to dramatically streamline the routine things so that you can focus on the important stuff. The simplest and best way that smart home technology can make a difference in your home is to take the burden of drudgery off your shoulders. Smart sensors are exactly how this is achieved. When you think about smart home sensors, you probably picture motion detectors. These are the most common type of sensor, and one we’ve been familiar with for decades at this point. In the past they opened doors at the grocery store, turned on hand dryers, and more. Today, they accomplish much more. 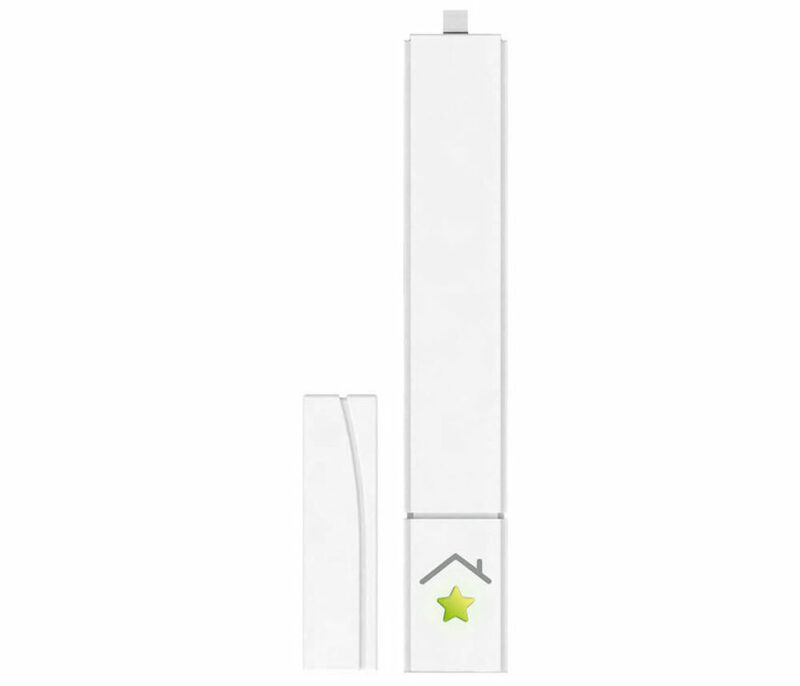 Here’s the SmartThings SmartSense Motion Sensor. 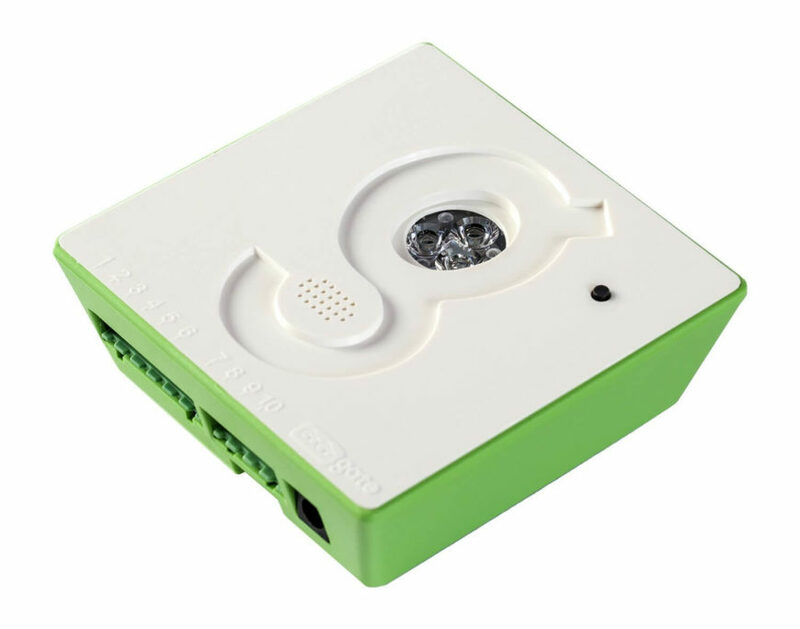 This simple and discreet motion sensor can be programmed to trigger actions in a number of different devices, all connected by a central smart hub. 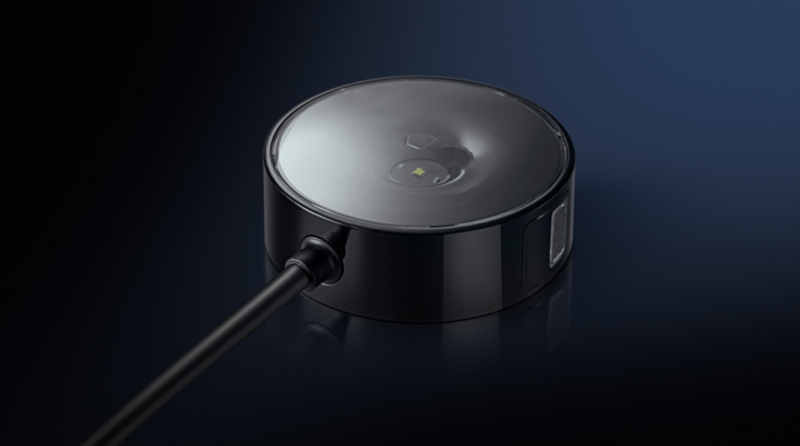 This particular device is meant to work with Samsung’s SmartThings hub to allow you to set a wealth of conditions under which your other connected devices will activate. It allows you to turn lights on as you enter a room, trigger alarms for security while you’re away, and even set thermostats, window AC units, or portable heaters to automatically adjust based on temperature readings. The small size means it can be placed or mounted anywhere. This is the OxyLED. One of the most straightforward uses of sensor technology is to pair it with lighting. This luxuriously styled aluminum wall sconce is designed as a lightweight device you can stick on any wall, providing light only as needed in fashion. Using both infrared and motion sensors, this device will activate its light based on occupancy and ambient light levels. Place it in a hall or room and it will illuminate your space only when necessary, in the dark and when you’re in the room. 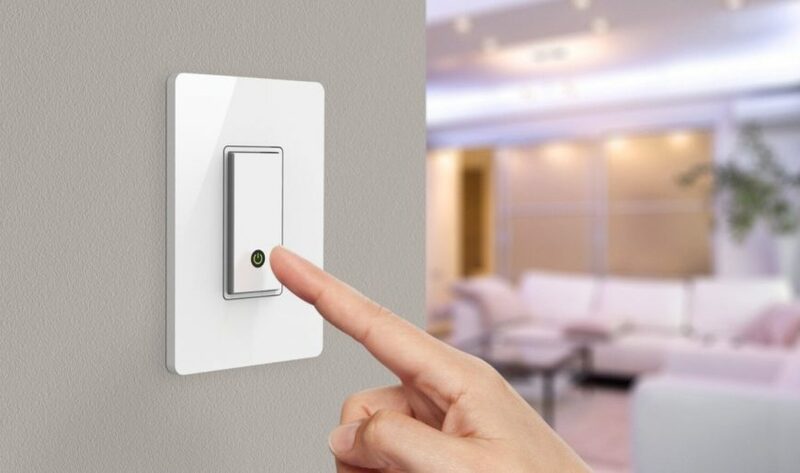 Check out the WeMo Light Switch! This handsome little smart light switch is wifi enabled, letting you control your home lighting from virtually anywhere on earth. Compatible with the Amazon Echo smart home hub device, it will become an integral part of your smart home ecosystem. 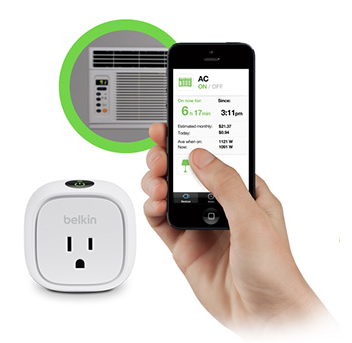 Replace any old switch with the WeMo and you’ll be able to create customized schedules. For example, set your porch light to go on at sunset or set the kitchen lights to turn on before you get up in the morning. Check out our complete Smart Home Sensors guide! We covered a range of the best of the best when it comes to smart home devices designed to elevate and enhance your life. 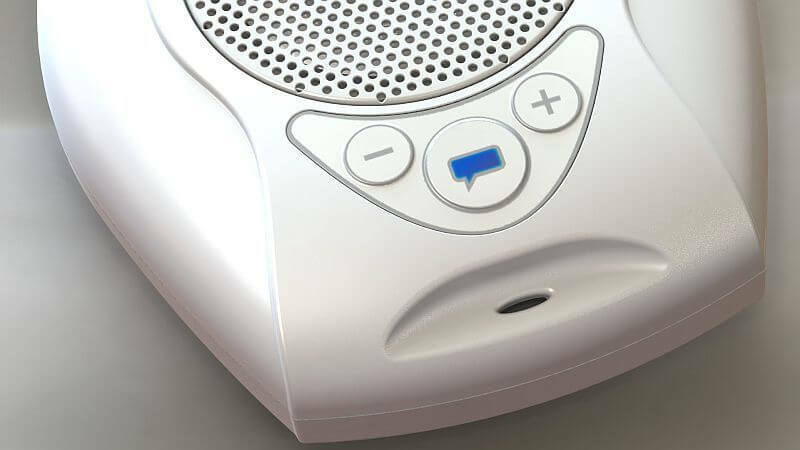 In this gallery, we focus on the devices that have been crafted specifically for voice interaction. The main selling point with voice activated products is that they use one of the most natural of human behaviors to command, interact, and monitor your devices and your home itself. Speaking is something almost everyone can do, and it requires no learning curve. When you’re free from the hassle of learning a new remote, device, or app, you no longer have to worry about programming, memorization, or any complex routines just to get your smart home devices to function properly. We love the idea of a smart home hub that connects every one of your other devices in a seamless, central location. Adding voice control elevates this idea to a whole new level. 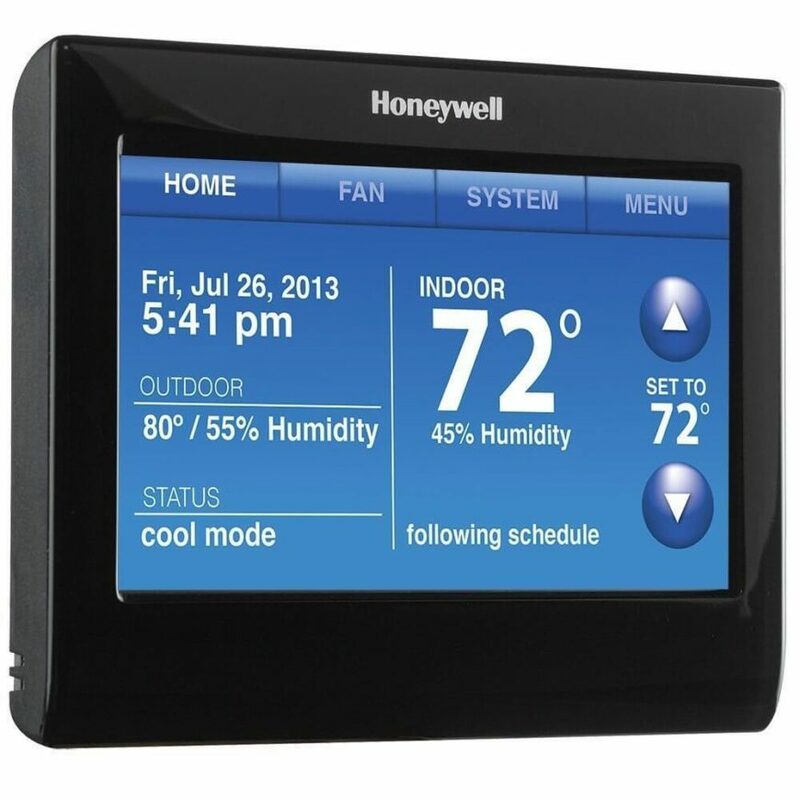 Meet the Honeywell Wi-Fi Smart Thermostat with Voice Control. This sleek and display-friendly smart thermostat is built to listen to your voice and can learn new commands based on how you interact with it. This learning function is what elevates it beyond a mere voice control gimmick into the realm of truly smart devices. You can use simple, intuitive language to program it, saying things like, “make it four degrees warmer.” The device gets smarter over time, adding commands based on interactions with you. 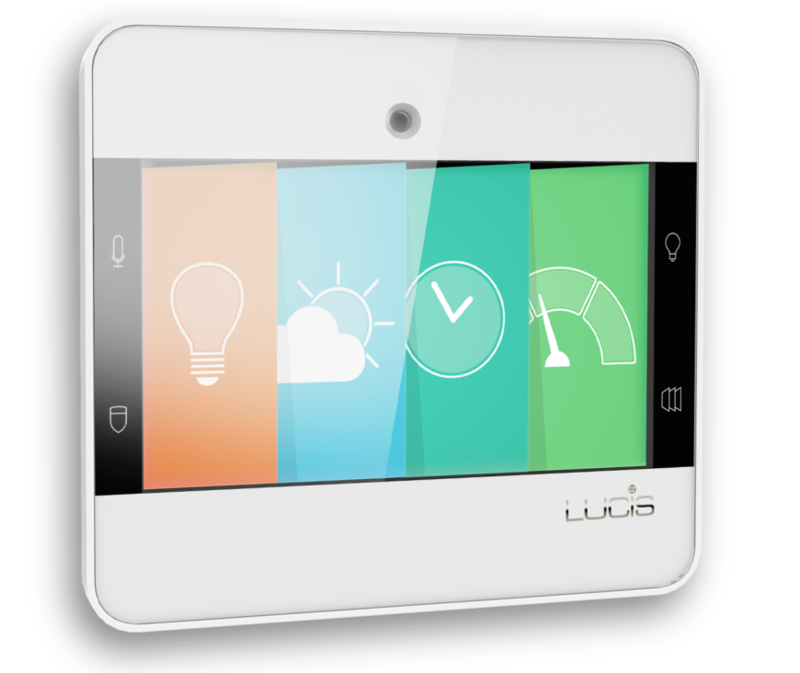 Even better, it offers a customizable touch screen, email alerts, weather forecasting, and wifi remote access. The Voice Pod is a small tabletop product that grants you hands-free control and speech feedback for your entire smart home ecosystem. Once activated, the built-in software acts upon simple speech commands to let you control any and all smart home devices. Phrases like “lights off” and “lock door” work intuitively and instantly. The device not only recognizes common phrases, but can also learn customizable commands to control anything from TV and music to lighting, thermostats, shades, and security systems. 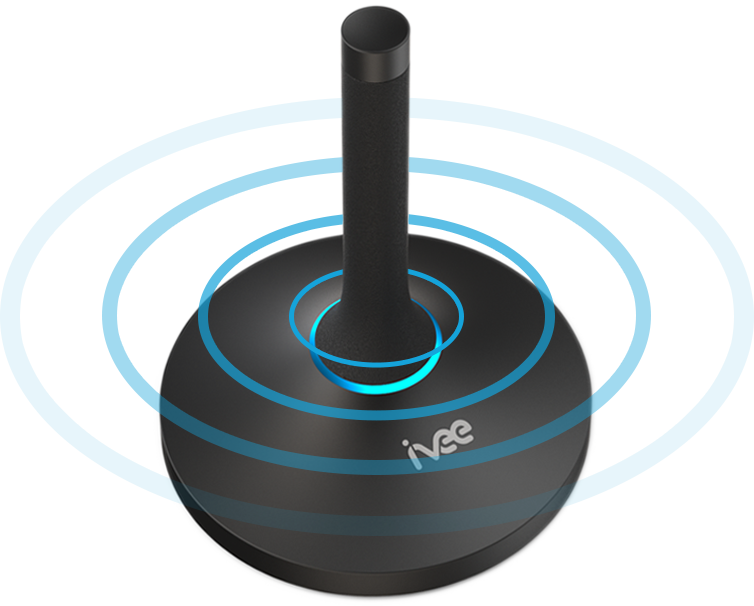 The Ivee Sleek is a uniquely styled home hub that’s entirely designed around interaction with your voice. It lets you control all of your home’s connected smart devices with simple spoken commands, letting you set reminders, wakeup timers, and fetch internet content like weather and news without lifting a finger. For example, state “Okay Ivee, set the thermostat to 72 degrees,” and the device will wirelessly execute the command. It’s compatible with a range of smart devices, including Nest, WeMo, SmartThings, Hue, and more. Even better, it interacts with apps like Spotify and Uber, letting you set up a ride or program a playlist. The microphone can pick up your commands from up to 15 feet away in any direction. Check out our complete Smart Voice Recognition and Voice Activated Products guide! Smart home technology serves to make our houses more comfortable, convenient, and safe places to live. When the technology comes to windows, our visual portals to the world outside, truly innovative things happen. We love the way that the best and brightest smart home technology has reaped rewards throughout the home, from security to heating, entertainment to irrigation, and everything in between. Windows are no exception. With this gallery, you’ll be seeing a lot of before-and-after photos that demonstrate the transformative power that smart technology brings to the formerly prosaic home window. 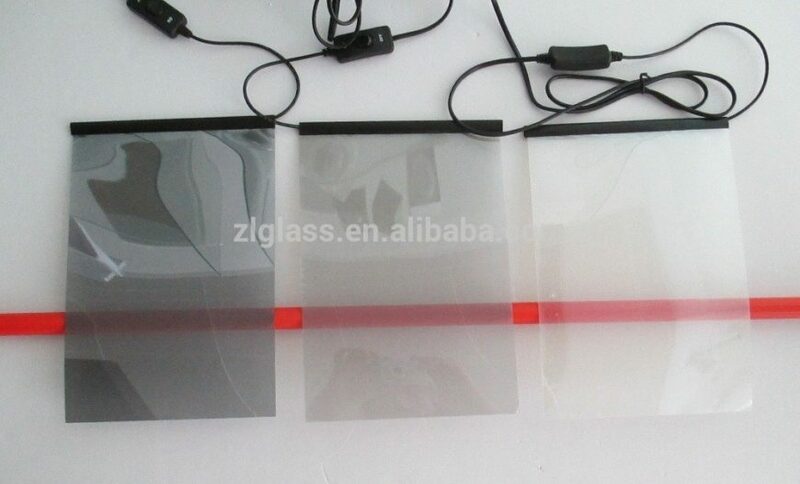 Because windows are meant to be transparent, the benefits of this technology might not be so obvious to grasp. We’ll do our best to describe exactly what sets these products apart and how they’ll improve your home life. The RWE SmartHome Door and Window Sensor is a slim, sleek, and fully discreet way to monitor your windows and doors at home. After a breezy installation, you’ll be able to check all access points to your house at any time, remotely via smartphone or computer. It communicates with other RWE smart home devices to work in concert, keeping your home safe and efficient: for example, radiators can reduce their output automatically when they sense that the windows are open, cranking back up when the window is closed. Currently found in workplaces, healthcare, education, hospitality, and government buildings, View Glass is coming soon to residential homes. You won’t need shades or blinds to keep out the glare and heat with this high tech window solution. Controlled by a mobile app on your Apple or Android smartphone, as well as predictive weather feeds and real-time sensors, the windows will become opaque whenever needed. Using an internet connection, the windows are able to pull information that lets them react to the date, time, and weather for fully automated function. You’ll be able to control light and air with a single tap on your smartphone, if you’ve installed Velux Smart Skylights. 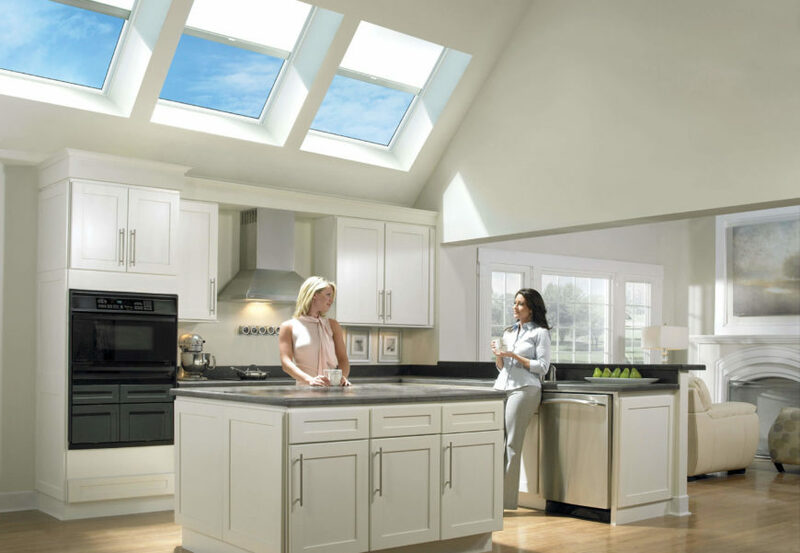 These skylights are a high tech, environmentally friendly, and money saving addition to any home, powered by a discreet solar panel. A rain sensor automatically closes the skylight at the first sign of inclement weather, and the solar powered blinds can con command. Check out our complete Smart Home Window Solutions guide! So what do we mean when we say “eco friendly” homes? The answer is both simple and surprisingly broad. When your home is made more environmentally friendly, it is improving in two very important ways. First, the home is having a lower impact on the natural world than it did before. This means that it is using less resources producing less pollution, a two-fold improvement. The second improvement is that when you use less resources, you typically save a lot of money. How much? The products detailed below can reduce your electric and water bills anywhere from 50% to 100%. That’s a radical improvement that will only get better over time. 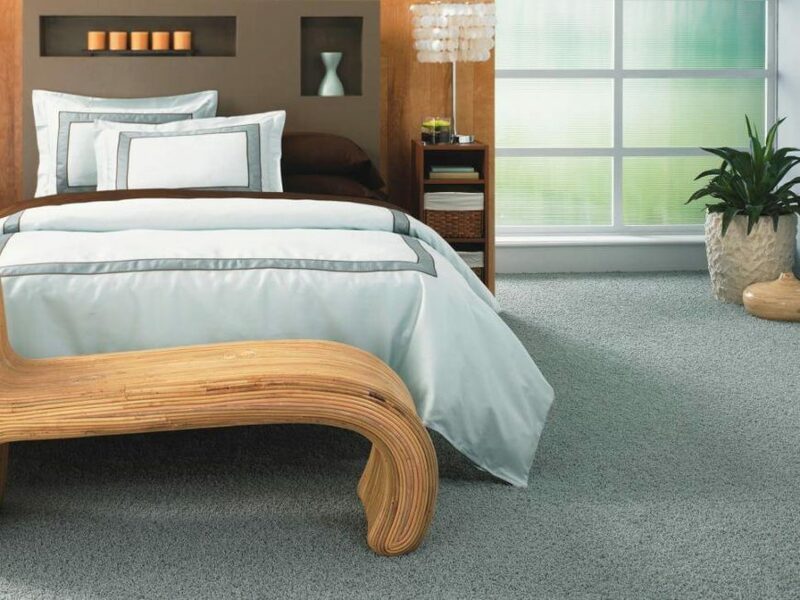 Unlike your standard carpets seen in homes and businesses worldwide for decades, SmartStrand Carpet is a refreshing change of pace that offers a step into the environmentally friendly future. It’s crafted with corn as a fundamental ingredient, processing extracted sugar into a key component of the fabric. This is spun into the SmartStrand fiber itself and tufted into beautiful carpet. The result is a highly durable yet totally natural carpet that’s perfect for families with young children and pets. The carpet is soft and stain protected as well, for a truly winning mixture. 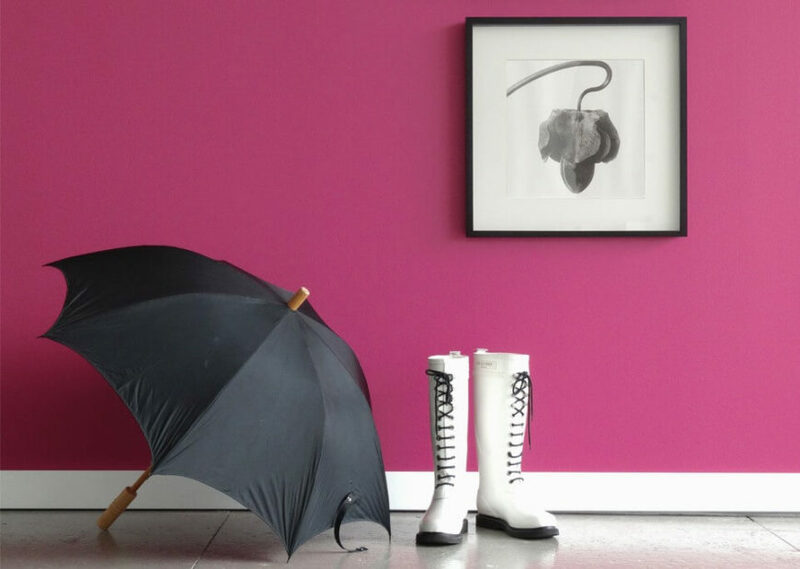 Considered Eco Friendly Paint? When you’re considering an environmentally friendly upgrade to your home, paint might not be the first or even last thing you consider, but it’s a surprisingly important facet. No matter what color you choose, you can get “green” paint by keeping a sharp eye out. The familiar fresh paint smell of the conventional type consists of greenhouse gases and harmful chemicals that are released into the atmosphere – and your lungs – when the paint is applied to a surface. Eco friendly paints will emit little to no similar smell, and contains no volatile organic compounds (VOCs). These paints will be free from many common ingredients, including toxic biocides, fungicides, and more. There are even environmentally safe pigments to make your color choice better. 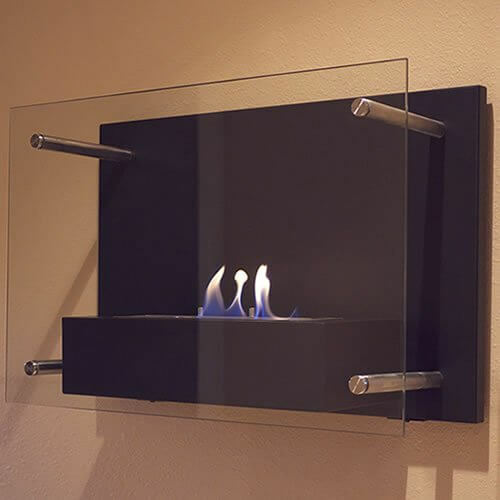 We love Bioethanol Fireplaces. Did you know that you can have a more environmentally friendly fireplace? We were surprised ourselves. Units like the one pictured below run on bioethanol, a denatured alcohol also known by the term methylated spirits bioethanol. It’s a completely renewable energy source made from the fermented sugar and starch components of plant byproducts, including sugarcane, corn, potatoes, milk, rice, and even grapes and other fruits. The combustion of bioethanol is so clean that you can completely ditch the chimney and flue, keeping heat directly in the room. There is no smoke to speak of, and it’s leagues safer than a standard wood burning fire. Check out our complete Eco Friendly Smart Home guide! These devices are the actual hands-on component of a smart home ecosystem, the way you go about controlling it. With a suite of smart home devices and appliances installed in your home, the final step is setting them in motion. Here’s where remote controls come in. Anyone who’s had to deal with a complicated home entertainment system knows that a good remote is worth its weight in gold. The same proves true for smart home technology, even more so. We looked high and low for the best ways to control our smart home devices, and came back with a lot of great products. Some of these are actually remotes, just like you use for your television. Others take the form of communication hubs, letting you do the actual controlling with your smartphone. 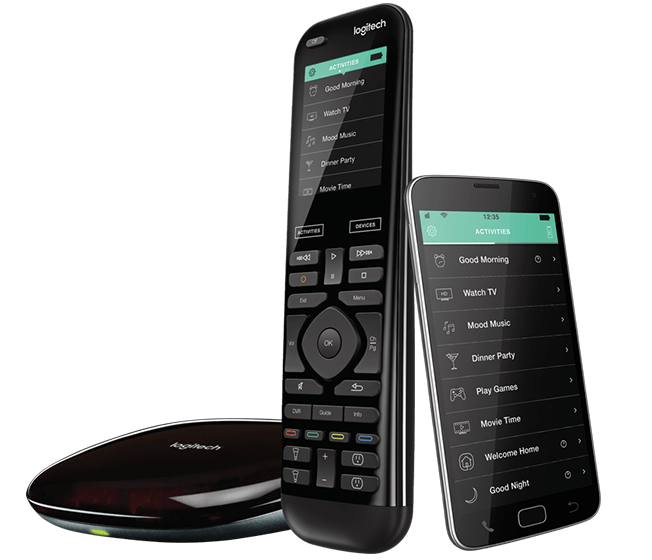 Here’s the Logitech Harmony Home Elite Remote. This smart home remote allows you to use either your smartphone, with an included free app, or the remote itself for one-touch control of the entire home entertainment system and your smart home ecosystem. You’ll be able to command devices like the Philips Hue lights or Nest learning thermostat with an easy to use remote. When paired with the Harmony hub, you’ll be able to control devices that are hidden away in cabinets or behind walls, even including game consoles. 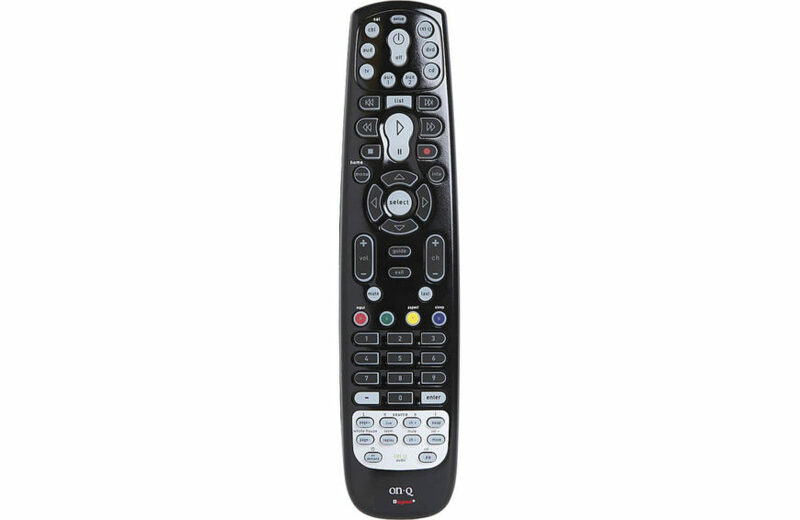 Meet the OnQ / Legrand Home Systems Remote. This handsome and stealthily styled remote supports all On-Q products with IR control, plus up to 7 additional IR modes can be used, all while looking like nothing more than a sturdy universal remote control. With built-in memory, device codes will never be lost when you replace the batteries. With a learning function, this remote can add features and functions unique to your specific devices, becoming more useful as you use it. 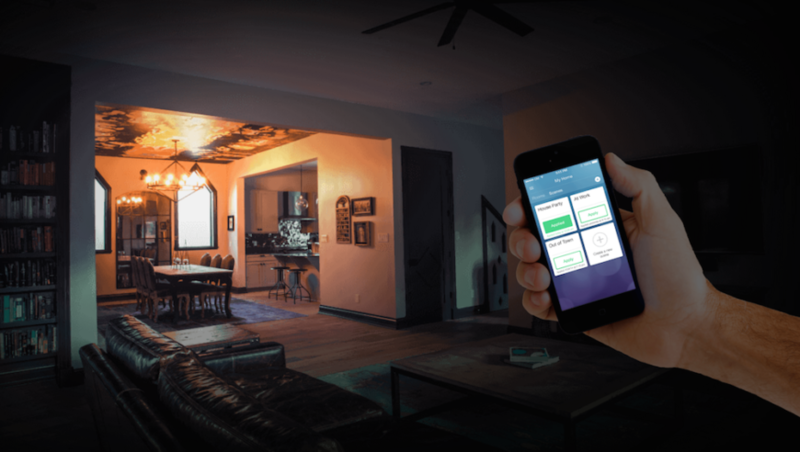 The NuBryte, from Lucis, is your ticket to advanced and complete home lighting control and security monitoring. The unique feature of this smart home device is its open design API, making it possible to integrate other sensors from various brands over a wireless connection. 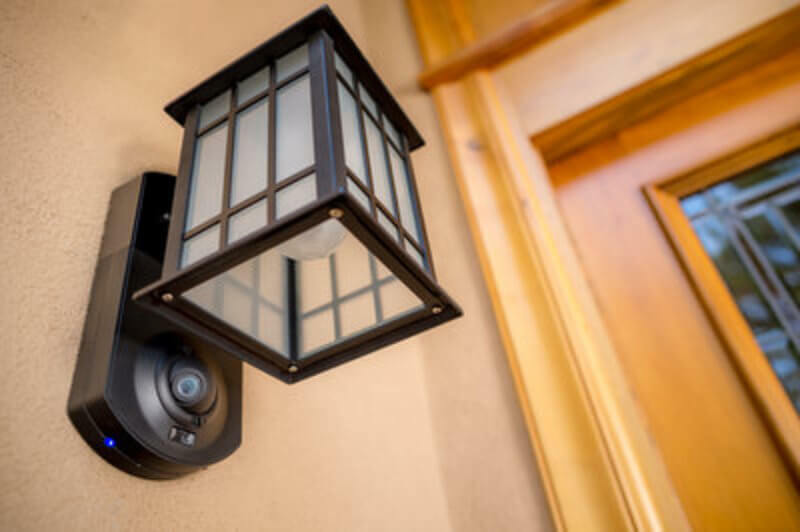 It allows you to use your phone to control lighting, thermostat and more, as well as monitor your security either via sensors or in real-time with a look at any smart home cameras you have installed. Check out our complete Smart Home Remote Controls guide! Since most of these devices are controlled via smartphone and tablet apps, we wanted to take a closer look at the software that make your smart home work together. While many smart home devices, especially hubs and other connectivity products, are paired with their own apps, we discovered a wealth of apps that work independently to connect and control devices. The WeMo app is designed to work with a suite of compatible easy-to-use products over the internet from your smartphone or tablet. It’s also compatible with very popular app IFTTT, which we will cover below. 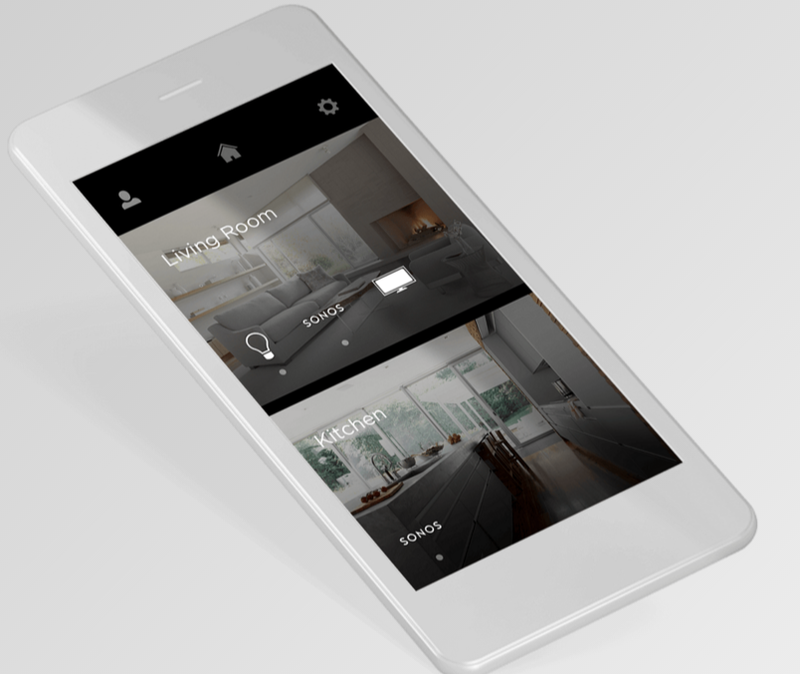 It comprises several functions, including Insight Switch, to show you how much energy your devices are using, Light Switch, to let you turn all the lights in the home on or off, and NetCam, which triggers home automation features when you walk in the door. The AT&T Digital Life app is designed to be a comprehensive suite of functions that work in concert to manage your home from the ground up. The app covers your home security via video monitoring, door control, energy management, and even water detection. Sensors and cameras are all directly linked via the internet, so that you can have a first person view of what’s happening, get alerts if anything out of the ordinary occurs, and make sure that your lights and thermostat are programmed exactly as you like, from anywhere on Earth. Savant lets you create experiences to reflect your personality and lifestyle, switching between Sonos, Apple TV, cable, blu-ray, and other entertainment options with your smartphone or tablet. Even better, it can connect to other smart home systems like lighting, allowing you to set “scenes” where entire sets of functions can work in concert. Check out our complete Smart Home Apps guide!